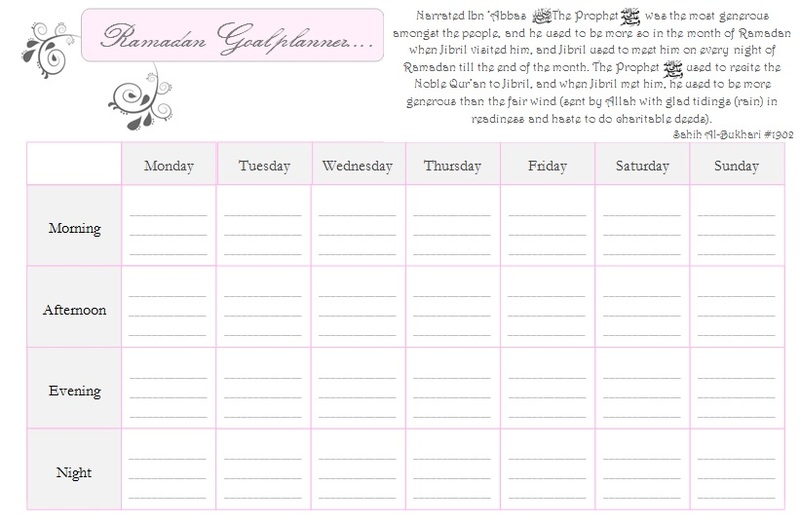 a muslim homeschool: Ramadan Goal Planner! Do you mentally have goals for what you would like to achieve each Ramadan, but don't always manage to fulfil them? Maybe you get side tracked, maybe you can never find the right time to fit your goals in, maybe you just don't know what you should do! Writing out a rough plan won't guarantee you will act upon it, however, by putting your thoughts onto paper, it may help you to organise and plan out your day so that you can comfortably find a suitable time to action your Ramadan goals inshaAllah, whether that is reading Qur'an, dhikr, charitable deeds....whatever it is you want to achieve this Ramadan! Think about what your daily schedule looks like during the week, we all have commitments that can not be ignored or neglected. So pen down those things first. Maybe every Monday evening you have a class, every Friday afternoon you look after your sisters children......write these commitments down. By doing so you will have a better idea of where you can find undistracted free time to action your Ramadan goals. Now, once you have all your regular commitments down, think about your goals, and when the best time will be to act on them inshaAllah. If you know the house is quiet straight after Fajr and you will have no distractions, maybe that is the best time to spend time with the Qur'an, or maybe you would find it easier in the evening after the kids have gone to bed until Maghrib comes. You know your schedule, so think about what will be realistic for you. Ramadan is a month which we all want to achieve the best we can for the Pleasure of our Creator. A little forward planning can help you to go along way inshaAllah! Download your Ramadan Goal Planner Free Here! If you have problems with the above link, try this one! I welcome your comments and feedback! However due to the number of spammers, I have added word verification to allow genuine readers to leave a genuine comment or question. The best Ramadan Journal for kids! Selected supplications from Hisnul Muslim to print at home for the kids! Print at home your own Juz Amma workbook! 30 days of Ramadan ahadith to read aloud with your family!